These cupcakes are very almondy. Almond is the predominant flavor but you catch the citrus as well, especially in the frosting. These cupcakes are great for the winter season and pair well with an Italian themed dinner. I made about 100 mini of these cupcakes along with 100 mini chocolate with salted caramel cream cheese frosting for an event. Both were a hit. The second is my go-to recipe for parties – always a crowd-pleaser. If you follow Cupcakeblog on Facebook, you know that I have been promising the recipe for Honey Bourbon cupcakes. Well, the last batch still weren’t quite right! I will be testing these out again very soon and hope to have a successful recipe to post this month. I might tweak it to fit this competition. I think I can’t resist entering this one, it’s just too up my alley. 1. Beat almond paste at low speed to loosen up, about 30 seconds. 2. Gradually add sugar while beating at low speed. 3. Continue to beat at low speed for 1 minute or so. 4. Add the ricotta and beat to combine. 5. While beating at low speed, add a tablespoon of butter at a time, waiting for the butter to incorporate until adding the next pat. 6. Stop the mixer, scrape the bowl, beat at medium for about 2 minutes until fluffy. 7. Crack eggs into a bowl and break up with a fork. 8. At low speed gradually add eggs about a tablespoon at a time, waiting for the eggs to incorporate until adding the next bit. 9. Beat again at medium speed for about 2 minutes. 10. Measure out flour, salt, and baking powder into a bowl and whisk to combine. 11. With a rubber spatula, fold flour mixture into the cake batter until combined. 12. Mix in orange juice and zest. 13. Scoop batter into cupcake liners, fill about 1/2 inch from the top (3/4 full). 14. Bake at 350 for about 20 minutes or until cake tester comes out clean. Note: These cupcakes are moist and don’t rise too much so you can fill the papers pretty full. They also stay flat if you like that. 1. Bring butter to room temperature by letting it sit out for a couple of hours. 3. Sift 3 cups of the powdered sugar into the bowl, add the juice and zest, and beat until combined. 4. Add more sugar and/or orange juice until you get to the consistency, flavor, and sweetness you like. Note: You can also add a little natural orange extract if you want to pump up the orange flavor. 2. Top with an almond or candied orange peel. Love the combo of flavors! I make a cheesecake with similar ones. I might not be able to find an internal off switch to stop eating! Love your frostings. these look so amazing. I love almondy flavour so I’m sure these will make me eat more than one. Beautiful cupcakes! Love the star frosting. They look so pretty, with the miniature size. 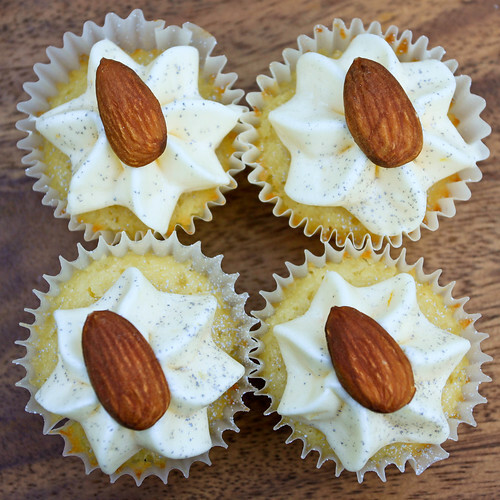 I’d like to recreate these since I am a huge almond fan; can you tell me what ratio almond/sugar is your almond paste, so I can track down something similar in Europe? Thanks! They sound and look delicious, I will definitely try these out! Wow! Inspirational, as always. This is just a quick note to say I am so glad you are back blogging when you can. You never cease to amaze me with your creativity and awesomeness! Those sound delicious and I love the stars. These look so beautiful, and sound delicious! I really love almonds in cake preparation, they provide cakes with a very special taste but never tried to mix almonds and orange flavor. I might give a try, though. Saving the page in my computer bookmarks to give your recipe a try! Wow. Orange and ALmonds sound so yummy together. I think white blanched almonds would be good here too. Or macona even to add a little bit of surprise saltiness? Dying to make these little guys!! I didn’t realize you were back to blogging! Yay, I’m excited, I love your creative recipes. This is a really good looking cupcake. I love the flavor of almond so I must try this cupcake. Great decorating as well. These are beautiful – I love almonds, and often bake with them, so will have to give this a try. Thank you for the inspiration and idea. NOt a recipe question, regarding decorating: What tip did you use for the frosting? I just made these over the weekend for a baby shower and they were a HUGE hit. I subbed in gluten free flour for the regular flour. I have to say that they were the best gluten free cupcakes I have made to date. The almond paste kept them moist for days afterwards. I am trying to figure out when I can make them again! Great recipe and great cupcakes! I like the almond on top. I am always challenged to find fresh and innovative items to place on the top of cupcakes. You inspire me!! I love it. Almond and Orange, great combination. These were so good! I’ve made them twice now, but the first time was a flop. I made the mistake of using part-skim ricotta. The second time I used whole and they came out great! These were amazing! My fiance LOVES almond so he was very impressed when he got back from work to these little beauts! Lovely! !